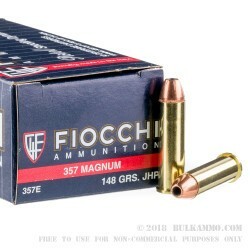 If you aren’t aware of Fiocchi’s quality 357 ammunition yet this is a great round to get involved with. The obvious quality of the components selected (Fiocchi generally can provide 100% of the components in house), and the fine ballistic numbers makes this load a great all-purpose round for those who want to shoot at the range with what they shoot for carry or home defense without causing so much pain in their pocketbook. 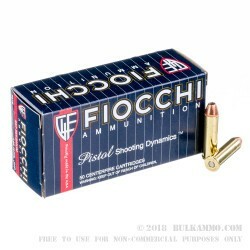 Fiocchi’s 148 grain jacketed hollow point ammo offers 1500 feet per second out of the muzzle and 720 ft. lbs. 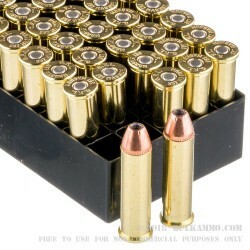 of energy which puts it in the top tier for general defensive loads out of the .357 Magnum. But you must factor in the legitimate price savings over competitor loads for substantially similar performance. You simply cannot find the type of performance for the money that you get here. Combine that with clean burning powders and excellent quality control, and you get reliability and easy clean up for a range day that costs less and delivers more. 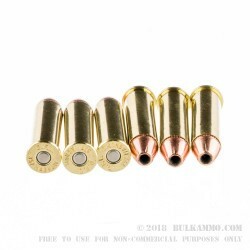 A fantastic round available at an even better price point, this is suitable for all .357 Magnum uses, including lever action and semi-auto firearms.